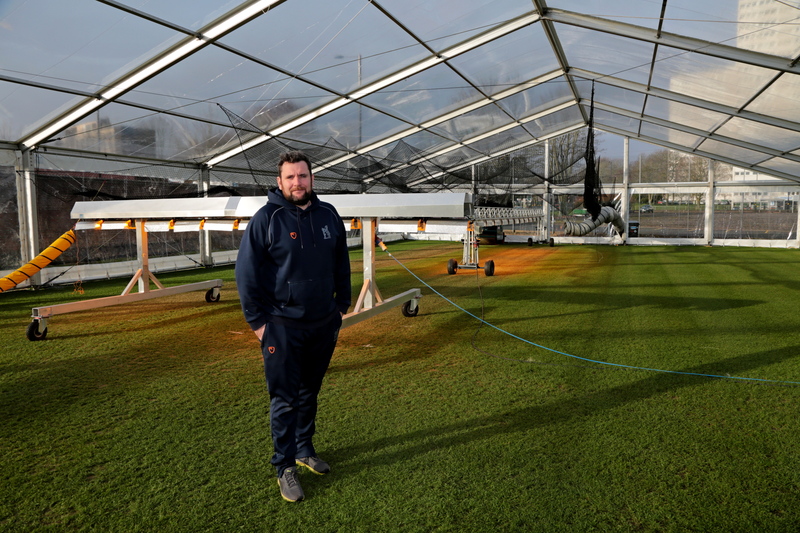 Stars of the big top: Laurence Gale pops into Edgbaston to see how marquees are providing additional preparation time for both grounds’ team and players. A recent visit to Warwickshire CCC enabled me the opportunity to catch up with Head Groundsman Gary Barwell, who now starts his seventh season at the club. He like the rest of the county groundsmen are busy getting their practice net facilities ready for the onslaught of as new playing season, which year on year seems to be starting earlier. 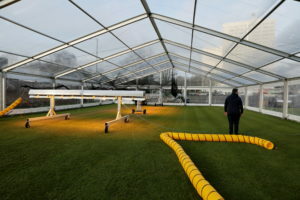 Warwickshire, like many of the other county clubs, have invested in the use of outdoor tented/marquee structures in recent seasons to cover their net areas, with the aim of creating a natural grass wicket practice facility that allows the club the opportunity to practice four to six weeks earlier. As the years have passed the sharing of knowledge and the development of these facilities has moved forward at such a pace we now have utilised a number of innovations to create the perfect indoor greenhouse environment using de-humidifiers, heaters and lighting rigs to control and manage both soil and air conditions in the marquee/tent thus allowing the staff to prepare and produce decent, natural grass wickets for practice in late February early March. 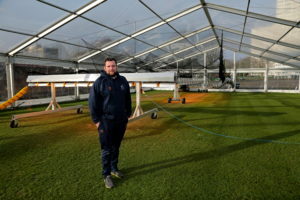 Gary was keen to show me their system, a huge 20metre by 18metre marquee that is able to cover nine, six foot wide wickets. 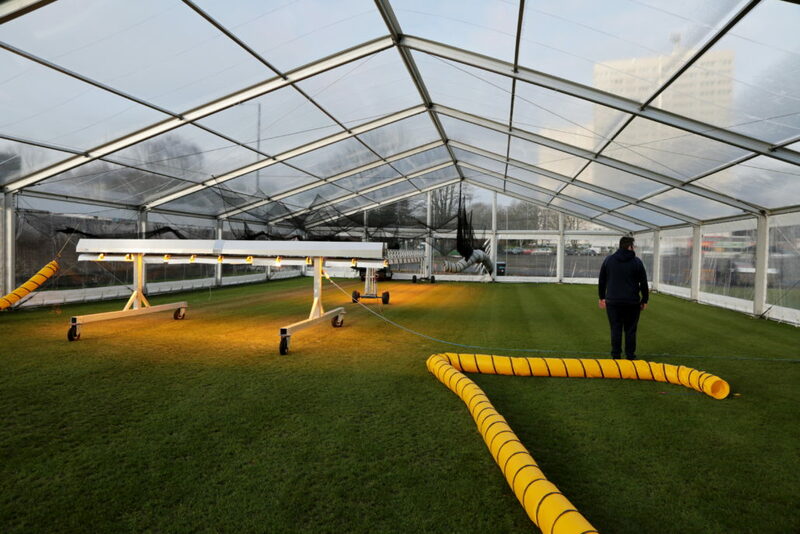 These wickets where covered with flat sheets in December to protect them prior to the erection of the marquee on January 8. It took four days to erect and a day to set up the humidifiers, heaters and lighting rigs. Some pre-season rolling, around five hours was done to the area using their blotter and auto roller, followed by a 14 day prep for the two first practice wickets. Everything is going well, however, they have had a couple of real cold nights -4 -6 degrees which has meant a lot more heat required to maintain their target of keeping an even 6 degrees inside the marquee at night. The de-humidifiers are there to prevent any condensation forming and dripping onto the wickets and bowlers run ups. Gary was able to maintain a comfortable 18 degrees during the day which is ideal for what he wanted to achieve. Everything was on schedule for when the team arrive for their first practice on the February 15 with the aim of providing six weeks of practice time for the team taking them through to April when they hope that their outdoor nets will then be ready for use. I am sure like many of the other county groundsmen the provision of early training facilities brings with it many challenges and additional work loads, but like most they revel in learning new skills and testing their abilities to produce the best playing surfaces they can for their clubs. balanced crank shaft on the XF that fires the tine into the ground so quickly that makes the difference. It does not seem to hang on to the tines when they come out so you don’t get ‘lift’. Everything is clean and precise and tidy. That’s what makes it fantastic. Indeed Wiedenmann UK credits Keith with pointing them towards introducing the 10 mm tine for cricket applications. “Keith has been a long-time advocate of the 10mm tine. He was the first to suggest and indeed the most vocal, that we were missing a trick by not having it, said Chas Ayres, Wiedenmann UK’s Sales Manager. During the cricketing aeration window usually Keith will in the main spike to a depth of 175mm or 200mm with 75 x 50 centres. “I will speed up or slow down to make holes wider or narrower. With so many cricket grounds to get through in a relative short amount of time Keith has to plan ahead to serve his clients, tending to allocate a week to 10 days for each county and basing himself in the centre of a cricketing area. Keith Exton’s affinity for turf excellence transfers to other sporting codes throughout the year but he and Perfect Pitches are best known within the cricketing world. “He’s the top authority,” said Chas.